This is beautiful evergreen shrub is Cistus corbariensis which has been flowering profusely for weeks now. The delicate white flowers, with their yellow centres, only last a day before falling off, to be replaced the next day by a whole new crop of flowers. There are so many buds the plant that it will be flowering for many more weeks yet. 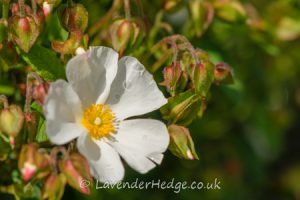 The rockrose likes full sun, but one shrub I have is in shade for about half the day, and it grows quite happily on our clay soil. I will lightly trim the shrub once it has finished flowering, but it doesn’t really require much attention.